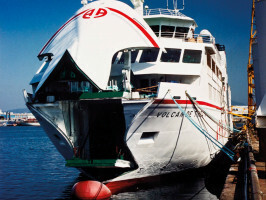 Explore the fabulous neighbouring island of Lanzarote in this great value ferry deal! - Fast journey, only 30 – 35 minutes! Fancy mixing up your holiday a bit? Want to explore a brand new location but without the stress of organization? 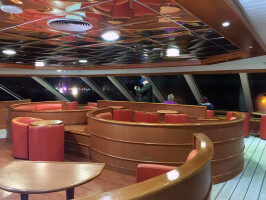 Then this ferry trip is perfect for you, taking you there and back in a mere 35 minutes each way, you’ll be exploring the beautiful island before you know it. 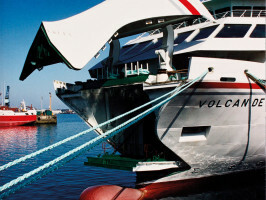 Leaving from Playa Blanca port in Lanzarote, we’ll sail across to Corralejo in Fuerteventura. Corralejo is a traditional fishing village, unique and bursting with character. With over 11km of sandy beaches and dunes, it’s no wonder that this resort is loved by so many around the world. Spend the day exploring, sunbathing, relaxing or enjoying a nice, refreshing drink at one of the beach front restaurants, the choice is yours! When you’re ready to come home after an action-packed day, sit back and relax and enjoy the ride back. *Only from Monday to Saturday. Return times from Corralejo at 8am, 10am, 2pm*, 4pm and 6pm. 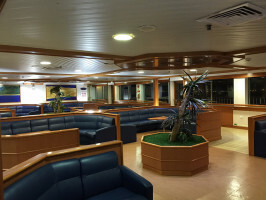 It is recommended to arrive at least 45 minutes prior to the ferry departure. Please note that excursions may be subject to change or not available during adverse weather conditions. Please go to: Playa Blanca Harbour, Playa Blanca, 35580. Remember that you must submit your booking voucher to the Naviera Armas ticket office and please do not forget to bring your ID. Meeting point 45 minutes before the tour starts. 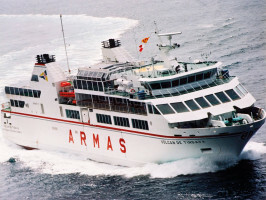 Naviera Armas Ferry (ACE-FUE-ACE) 30-35 minutes. ACE-FUE: 07:00am, 09:00am, 11:00am, 03:00pm*, 05:00pm. FUE-ACE: 08:00am, 10:00am, 02:00pm*, 04:00pm, 06:00pm. *Only from Monday to Saturday. From today’s date, the return journey with the ticket only tariff must booked on or before the following departure: From Corralejo – final departure available at 06.00pm. In case of emergency please call the emergency telephone number+ 34 971211601 (Languages spoken: Spanish, English) - 24 hours. “Please note that excursions may be subject to change or not available during adverse weather conditions.” We would also like to remind you, any cancellations due to adverse weather conditions or circumstances outside of the control of Naviera Armas or in the case of diversion or overnight stay of diversion or overnight stay due to cancelled departure, will not be compensated. In this event the client will be referred to the point of sale of their ticket to receive a refund.